Researchers have now mapped exactly where in the Western U.S. snow mass has declined since 1982. A University of Arizona-led research team mapped the changes in snow mass from 1982 to 2016 onto a grid of squares 2.5-miles on a side over the entire contiguous U.S.
A person could practically find the trend for their neighborhood, said first author Xubin Zeng, a UA professor of hydrology and atmospheric sciences. Grid size for previous studies was about 40 miles on a side, he said. In the Eastern U.S., the researchers found very little decrease in snow mass. 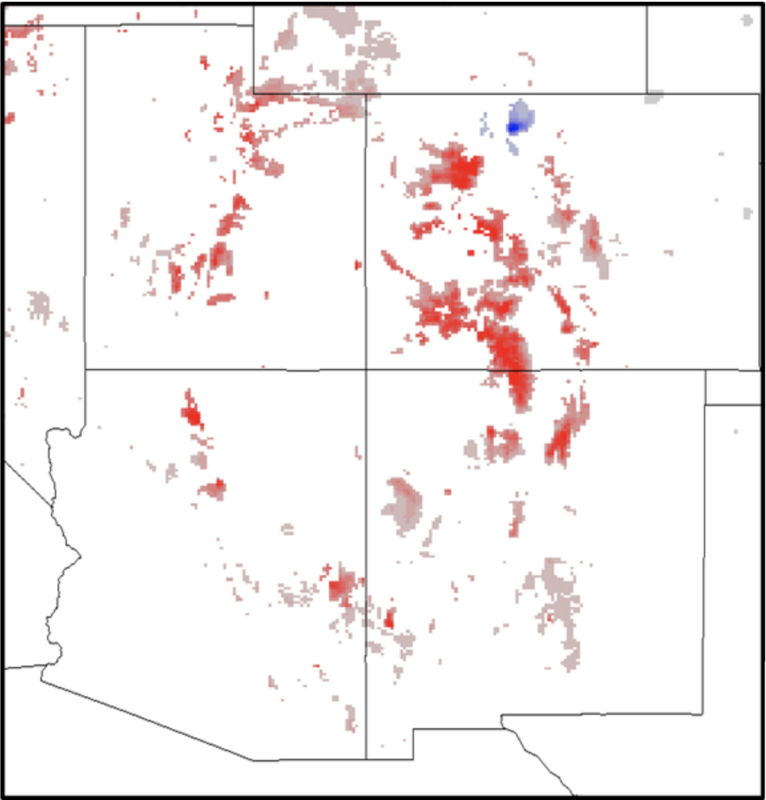 Even in snowy regions of the West, most of the squares did not have a significant decrease in snow. However, some parts of the Western U.S. have had a 41 percent reduction in the yearly maximum mass of snow since 1982. Snow mass is how much water it contains, which is important in regions where winter snows and subsequent snow melt contribute substantially to water resources. Snow melt contributes to groundwater and to surface water sources such as the Colorado River. Snow is also important for winter sports and the associated tourism, which is a multi-billion-dollar industry in the U.S. If all the squares in the Western U.S. that had a 41 percent reduction in snow mass were added up, the combined area would be equal in size to South Carolina, said Zeng, who holds the Agnese N. Haury Chair in Environment. He and his team looked at the interannual and multidecadal changes in snow mass for the contiguous U.S.
Zeng’s team also found over the period 1982-2016, the snow season shrank by 34 days on average for squares that, if combined, would equal the size of Virginia. Temperature and precipitation during the snow season also have different effects in the West compared with the East, the researchers found. In the West, the multidecadal changes in snow mass are driven by the average temperature and accumulated precipitation for the season. The changes in the Eastern U.S. are driven primarily by temperature. The paper, “Snowpack Change from 1982 to 2016 Over Conterminous United States,” by Zeng, Broxton and their co-author Nick Dawson of the Idaho Power Company in Boise, Idaho, was published in Geophysical Research Letters on Dec. 12. Previous estimates of interannual-to-multidecadal changes in snow mass used on-the-ground, or point, measurements of snow height and snow mass at specific stations throughout the contiguous U.S.
One such network of data is the National Weather Service Cooperative Observer Program (COOP), in which more than 10,000 volunteers take daily weather observations at specific sites throughout the U.S. The other is the U.S. Department of Agriculture’s Snowpack Telemetry, or SNOTEL, network, an automated system that collects snowpack and other climatic data in the mountains of the Western U.S. However, for many locations, such measurements are unavailable. Zeng and his colleagues used an innovative method to combine data collected by COOP and SNOTEL with a third data set called PRISM that gives temperature and precipitation data over all of the lower 48 states and is also based on on-the-ground measurements. The result is a new data set that provides daily information about snow mass and snow depth from 1982 to the present for the entire contiguous U.S. Developing the new dataset has allowed the UA-led research team to examine the changes in temperature, precipitation and snow mass from 1982 to 2016 for every 2.5-mile by 2.5-mile square in the contiguous U.S, as well as to study how snow can affect weather and climate. “Snow is so reflective that it reflects a lot of the sunlight away from the ground. That affects air temperature and heat and moisture exchanges between the ground and the atmosphere,” said Broxton, an associate research scientist in the UA School of Natural Resources and the Environment. Zeng is now working with NASA to figure out a way to use satellite measurements to estimate snow mass and snow depth.